I am ultimately interested in how living systems (at the scale of cells and tissues, and possibly, organisms ! ), composed of physical entities such as molecules, molecular aggregates and driven far-from equilibrium, have self-organized (evolved) to perform ‘engineering tasks’ such as efficient processing of information, computation and control. This potentially brings together many fields of research including non-equilibrium statistical physics, soft active mechanics, information theory and control theory to the study of biology. In approaching a complex system such as the living cell, it is easy to be swamped by molecular detail. Thus one of the tasks of theory is to arrive at a good compromise between complexity and analytical or computational tractability. While it is important for theory to come up with quantitative predictions which can be experimentally tested, an equally important task is to arrive at a qualitative understanding with minimal phenomenological inputs, whose relevance goes beyond the specific system under investigation and aims for a broader canvas. Apart from exploring new physical principles, I am keen on being able to devise experimental strategies to explore and test these seemingly abstract ideas. 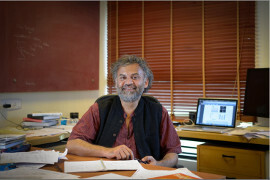 In this regard, I have been having very fruitful collaborations, primarily the groups of Satyajit Mayor (NCBS, Bangalore), GV Shivashankar (MBI-Singapore) and Thomas Lecuit (IBDM, Marseilles). Since the cell surface has to manage and process a large spectrum of information from the outside into the interior of the cell, its composition must be organized and regulated over different spatial and temporal scales. A great challenge in cell biology is to understand the physico-chemical principles that underly this regulatable organization. We have been studying the local control of composition and shape of the cell surface as an active composite of a multicomponent, asymmetric cell membrane coupled to a cortical layer of actin and myosin using a variety of theoretical and experimental techniques. This has implications for cellular processes such as molecular clustering, cell surface signaling, molecular sorting and endocytosis. We also use the setting of the active composite model to address questions of cell surface computation as appears in a variety of signaling setups such as Integrin signaling and T-cell signaling. These studies are done in close collaboration with S. Mayor’s group. The membrane of a cell is an active, complex interface between the inside and outside of a cell. It is the cell's primary source of information about the external environment, and its spatial and temporal fluctuations. How best can we deploy molecular sensors across the membrane in order to sample these fluctuations? How can the resulting information be transmitted with least loss to the correct intracellular target? We use basic principles of Information Theory to formulate these questions in an abstract setting. This approach produces falsifiable predictions about the structure of the membrane and of the downstream signaling pathways. Surprisingly, this approach makes connections with the predictions of the active composite model of the cell surface. This work is largely in collaboration with Garud Iyengar, Columbia University. It has long been recognized that living cells have evolved a variety of homeostatic control mechanisms to maintain physical and chemical quantities at their set point. However, except for a few cases the physico-chemical basis of homeostatic control in eukaryotic cells is largely unknown. We are developing a mathematical framework to understand the active stochastic control of cell surface area or tension, in terms of the dynamics of active reservoirs (e.g., endocytosis, caveolae, etc. ), characterized by different response times and capacities. We use this formalism to study the interplay between endocytosis rate and cell spread area upon detachment from a substrate and upon subjecting the cell to osmotic shock. In this we are collaborating with the group of S. Mayor. The remodeling and transport of organelles and vesicles are also active processes. We are interested in the active dynamics of intracellular trafficking in the endosomal and secretory pathways, which involves the interplay between organelle (membrane) shape, composition and activity of fission, fusion and transport. In this context, we are studying the remodeling dynamics of mitochondria and Golgi, and the biogenesis of the Golgi cisternae, using the analytic and numerical techniques of nonequilibrium statistical physics and soft matter. More recently we have formulated an optimization strategy associated with cell-type identification and discrimination, involving the interplay between sequential enzymatic processing of glycans and the dynamics of trafficking across cisternae. In these projects we are collaborating with the groups of Pierre Sens (Institut Curie), Mustansir Barma (TCIS-TIFR) and Garud Iyengar (Columbia University). We have shown that mechanically, the cell nucleus is described as an active polymeric gel. This has implications for the spatiotemporal patterning of chromatin within the nucleus and in-vivo interphase chromatin folding at large scales. Our results lead us to conjecture that the chromatin conformation resulting from this active folding optimizes information storage by co-locating gene loci which share transcription resources. In addition, we are interested in understanding how mechanical and chemical signals propagate from the cell surface to the nucleus to affect nuclear shape changes, chromatin organization and gene expression, using an active hydrodynamics formalism. We are working with the groups of GV Shivashankar and J. Prost (MBI-Singapore) on many of these aspects. The patterning and remodeling dynamics in tissues is driven by an interplay between active mechanical stresses from actomyosin, cell adhesion forces from cadherin and a multiplicity of signaling pathways. We have been studying the dynamics of cell intercalation during germ band elongation in the drosophila wing imaginal disc, driven by actomyosin pulsation and flow using an active elastomer model. We are studying the dynamics of epithelial sheet flows during posterior midgut invagination. This work is being done in close collaboration with the group of T. Lecuit, IBDM, Marseilles. In addition, we have been interested in the active dynamics of dorsal closure (with M. Narasimha, TIFR) and the scale invariance of developmental patterning in tissues (with K. Vijaykumar, ICTS-TIFR). We have recently become interested in collective cell dynamics and the dynamics of cell extrusion. We are interested in a wide variety of problems dealing with the dynamics of proteins – dynamics of folding in in-vivo conditions, dynamics of fluctuations in enzymatic reactions, directed assembly of large protein complexes such as Ribosomes and the dynamics of coordinated structural changes and allosteric propagation within signaling proteins (with S. Sastry (JNCASR) and A. Srivastava (IISc)).